The problem with 2-liter bottles of coke is that they get flat fast. For those of you with tons of money to blow, you could just get the Fizz Keeper cap, which adds pressure to carbonated drinks by pumping air inside that helps keep the dissolved gas from leaking out. If you're the DIY type, you could always make your own version with a tire valve and use a tire inflater. Even then, you run into the problem of having your friends laugh at you every time you pull out your Coke or Pepsi (or whatever). So, while opting for a product like that would probably work, the science behind it works with far inferior and cheaper methods. The cooler it is, the better it will keep. Basically, in order to keep a dissolved gas in a solution longer, that solution must be as cold as possible. That's why cold soda is so much harder to chug when it's cool. ASAP. As soon as you open up your soda bottle, pour your drinks and put the cap back on immediately, screwing it on as tightly as you can. It may not be the prettiet method, but it definitely does the trick. After you pour some soda (maybe around 60 percent) out of the bottle you can squeeze the bottle to remove as much excess air as you can. Now, why does this help you ask? It's all about Henry's Law, which states that, "At a constant temperature, the amount of a given gas that dissolves in a given type and volume of liquid is directly proportional to the partial pressure of that gas in equilibrium with that liquid." Yeah, totally makes sense right? Pretty much, when you first buy a bottle of soda, the space above the liquid is almost pure carbon dioxide (CO2). So when you twist it, that hissing sound is the CO2 coming out. Now, if you leave a bottle half-full of soda sitting around, the CO2 will seep out much faster because of the lower amount of pressure and the larger amount of space above the liquid (soda). So, by crushing the bottle, you in turn decrease the space above the solution and increase the amount of pressure inside the container. 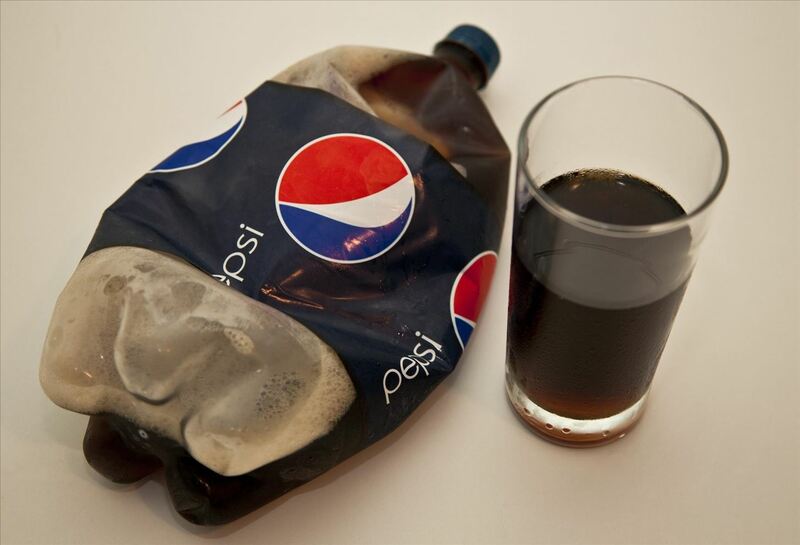 Interesting fact: PepsiCo introduced the first two-liter bottle of soda in 1970. This may be the most obvious thing to say, but expired soda just doesn't taste as good as the fresh stuff. Carbon dioxide and air can actually diffuse through the plastic, so no matter how tight your screw that cap on, there's always going to be some gas leakage. 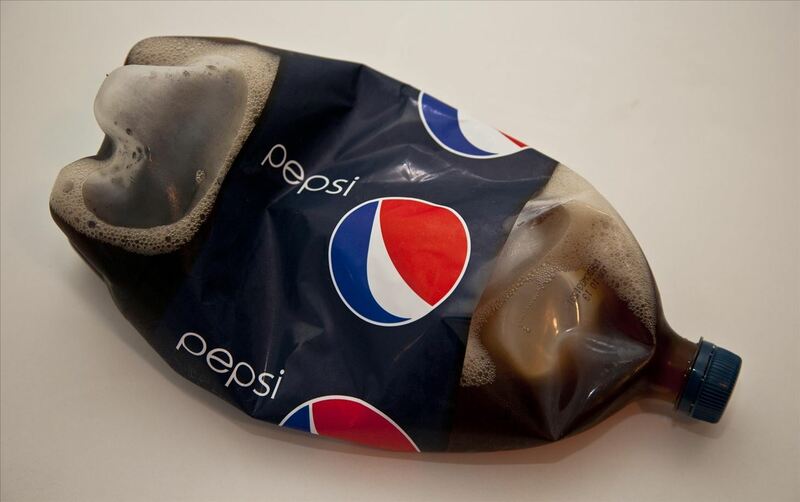 Do you know of any other methods to keep your sodas from going flat? Let us know in the comments. "Squeezing the bottle as you described and then capping it will produce a less than 1 atmosphere pressure condition inside the bottle because the flexible container will try to return to its original shape. The reduced pressure inside the squeezed bottle will encourage the carbonation to be released from solution. This will make the soda go flat sooner." I think it depends on how flat the soda is to begin with, and how much soda is in the bottle. If you had half-flat soda filling half the bottle, and you didn't scrunch it up, more CO2 would leak out of the liquid into the large headspace, which would be released when you open it. If you did scrunch it up, there's less headspace to fill and it leaks out of the liquid at a slower rate. If the soda wasn't half flat to begin with, but still full of CO2, then it would force the squished bottle to expand causing it to go flat sooner. So, the key is probably to make sure it's already pretty flat, so that it expands the bottle back out at a slower rate. Some believe that shaking the bottle to try to dissolve the gas back into the liquid from the headspace will help, but it actually has the opposite effect; only repressurizing the bottle will help force the CO2 back into the liquid. I keep my empty 20 ounce bottles and when I open the 2 liter for my first drink , I pour the rest into several 20 ounce bottles, after reading this article, I will make sure to pour all the way to the top and store all bottles in the coldest part of the refrigerator (bottom drawer with the lower temperature setting built into my 20 yr old GE frig that works as efficiently than new ones at 3kw per day @ .07perkw= 21 cents day or $75 a year, oh how I love Texas low power rates....if you can find them) although I notice my new deep freezer only added 1kw per day or $25 a year ......anyone have figures on cost of a deepfreeze verses refrigerator?) Also, has anyone looked at freezing their coke....like what % volume you need to leave in air so the ice can expand without busting the bottle? yeah I'm a rocket scientist, but I had to drop and repeat thermodynamics class, but only because I like electricityzzzzzzzzz. Someone once told my mother and I about the squishing the bottle trick. It's way cheaper to buy 2 litre vs. cans altho I prefer cans and on some random occasions I just get into a kick where I'm making a lot of drinks for myself. Having to keep opening can after can gets annoying. So I decided to try this cause my soda is always flat by the time I hit the bottle again for the first time after opening and I hate wasting stuff. Which is what continuously happens. I eventually pour out the 1/2 or 1/4 of the flat soda once I buy a new one. So anyway I tried it and when I went back to the fridge, the bottle was back to normal. I turned the cap as tightly as I could so it was weird that the air got right back in. 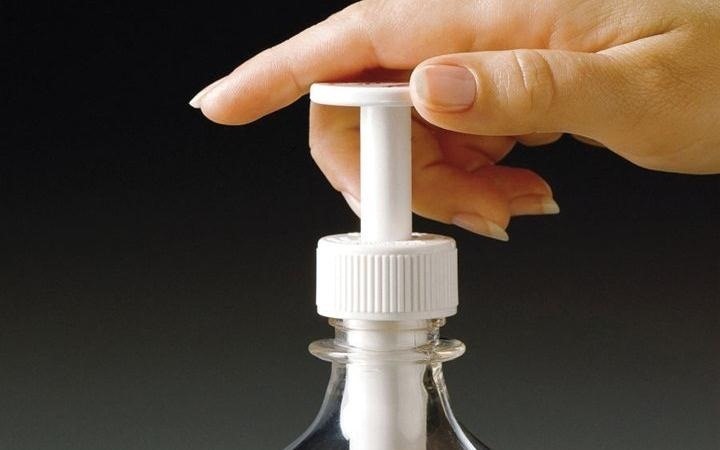 The squeezing method wont work unless you squeeze the bottle and keep it squeezed until you open the bottle the next time. The squeezed up bottle wont retain its shape and will try to get back to its original shape, this will force the CO2 to come out. To put it technically, you reduce gas by decreasing volume --> volume increases ( bottle comes back to its original shape) thus reducing pressure and again forcing the CO2 out. You end up doing the exact opposite of the fizz pumper cap. Keep it cold. Keep it capped. Don't squeeze the bottle. Don't stand on your head. Don't pray to goofy idols. Check out gas laws on Khan Academy if you want to know the facts. That said, the gas wants to escape the liquid that it is trapped in. If it has room, it WILL escape. Squeezing the bottle only gives it more room to expand, therefore leaving the liquid... Leaving the liquid flat. Temperature plays a big part on whether or not a gas stays or leaves. You do the math, a warmer gas expands and elevates, a colder gas contracts and stays. You will actually make the soda worse by using a "fizz saver" gadget that pumps air into the bottle, such as the illustrated "Fizz Keeper" cap. This is exactly because of the "partial pressure" reason mentioned later in the article. When you pump ambient air containing nitrogen/oxygen into the bottle, it will displace the CO2 dissolved in the liquid, and it's CO2 that's necessary for effervescence. There are many soda bottle "dispenser cap" gadgets available which do not let outside air into the bottle while they pour the liquid out. Try using those. I have found it helpful to screw the cap back on tightly once you have taken out some soda to drink and shake the bottle vigorously. Put back in refrig. The bottle becomes very hard so its seems like a vacuum seal. Of course I wouldnt do this if someone was coming back in 5 minutes to reopen. But I have never had it explode o n me and it seems "fizzier" and fresher this way. stock it on the fridge upside down.. Soda bottle caps are designed not reseal tightly once the cap seal ring is broken upon opening, so they will go flat. If you buy o-rings the same diameter as the inside of the cap, put one inside the cap, squeeze the air space out of the bottle, and screw down the cap tightly, the soda will be fizee a very long time. The "fizz keeper" which pumps air into the drink bottle will NOT increase the carbonation of the soda. It is a hoax. Henry's law states that the amount of dissolved gas in a solution is a function of the partial pressure of THAT gas above the liquid. In order to increase the amount of dissolve CO2 in the soda you would have to pump in CO2, NOT air. Crushing the bottle is probably the worst thing you can do, unless you clamp it or something like that to keep it from inflating back to its original size, try to crush a soda bottle and take time lapse photos of it and see how the bottle inflates back to its original size by the gas from the drink. Also, closing the cap as tightly as you can is not very helpful, you only need to close it as tight as it was closed when it was still sealed (this tightness holds up the gas usually much longer than the bottle will be in your fridge), closing the cap very tightly only ruins the gasket and making it less efficient and will result in unwanted gas loss. The only thing that will efficiently sustain the gas in the drink is a pressurized environment, you can achieve that by either compressing gas back to the bottle, or moving the drink to a smaller container, a process which is not that recommended for it causes gas loss as well. If you close the soda bottles too tightly everyone will hate you for it and your soda will still go flat! I appreciate the equations, but they don't care. These people are just looking for the answer. I think you've summed it up quite eloquently but... I don't think they got it. There's a world of difference between knowing the answer and being able to explain the situation to achieve the intended goal. Good to hear all these views. My takeaways are - keep bottles as cold as possible; the shaking the bottle and compressing the bottle approaches are worse than doing nothing (as I have found from experience), and I will look at the o-ring suggestion but not sure it will help as bottles need to be airtight so they are not flat when bought. Probably the best answer is to buy smaller portions if you can afford it. No big savings in big bottles if it's not a big party. Cheers to you, Master Lane! Excellent gleaning of the information. The air pump gadget, according to Henry's Law, apparently does no significant good, but the bottle squishing is definitely making things worse. The bottle naturally wants to return to its original shape and volume... as it does, it is actively vacuuming the carbon dioxide out of your soda. This has always been common sense to me, that the equilibrium cannot be restored until the bottle is re-pressurized, and the only source of repressurization is (normally) the fizz coming out of the soda. Very often at parties other people will put the cap back on a large soda bottle while there is still a large dent in the bottle from them gripping it. This has always been a pet peeve of mine, as the result to me is so glaringly obvious. I'm always careful to pop out any dents before I tighten the cap. At least then the repressurization process is starting from "zero" instead of a negative pressure situation. A key point to remember is that a significant part of the "air" that you squished out of the bottle was actually carbon dioxide that you wanted to keep and now have to replace -- out of the liquid -- before repressurization can begin.